Fires at a Bangladesh apparel factory that made items for retailers like Wal-Mart and Sears killed 112 workers last weekend. A deadly fire at a Bangladesh apparel factory that manufactured items for major U.S. stores like Wal-Mart and Sears raises troubling questions about the high cost of cheap clothing, and whether the world's largest companies are doing enough to monitor worker conditions in their overseas production facilities. A total of 112 people were killed and at least 200 more were injured in a fire Saturday at the Tazreen Fashions Factory, located near Bangladesh's capital city Dhaka. Two days later, another apparel factory near Dhaka caught fire. Ten people were injured after jumping from windows to escape the inferno at the 10-story building. Eye witnesses say that managers had locked the windows and gates to the buildings, which had no fire escapes, effectively trapping the workers in. Photos of items sold at Wal-Mart (WMT) taken in the Tazreen Fashions factory surfaced in the days following the fire. The retailer responded by saying that the factory was no longer authorized to produce merchandise for it. "A supplier subcontracted work to this factory without authorization and in direct violation of our policies. Today, we have terminated the relationship with that supplier," Wal-Mart said. Sears (SHLD) also said that the factory produced merchandise for the retailer without its approval and that it has since terminated its relationship with the vendor. On its website, Wal-Mart says it monitors undisclosed subcontracting by conducting audits and enhancing its standards for suppliers. It defines subcontracting as factories in its supply chain that weren't properly disclosed or that it didn't know about. Sears also said that the factory violated its code of conduct. 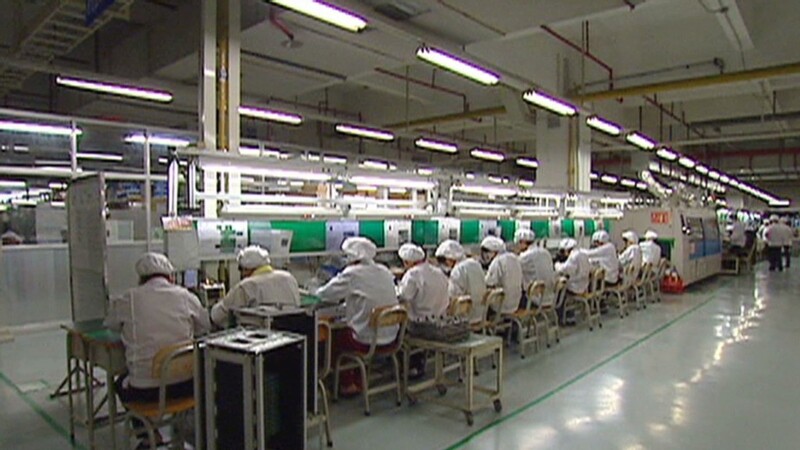 Workers rights experts, however, claim that it's unlikely that retailers wouldn't know where their stuff is produced, as a matter of cost and production control. "In order to be profitable, you have to control the supply chain, monitor quality, prices and the speed of delivery," said Scott Nova, executive director of the Worker Rights Consortium. "It's strange that a company would say they had no idea who was making stuff for them." Wal-Mart's website says the retailer conducted 9,737 audits on 8,713 factories that supply private-label and non-branded goods to Wal-Mart in 2011. The audits, completed by what it calls accredited or internationally recognized auditing firms, are carried out every six to 24 months. But the reports are not published online. Nor are they shown to factory workers, according to Nova. "There's no transparency. They never publish their findings as to whether or not there's a violation, so there's not much scrutiny about the audits," he said. The issue, experts say, runs deeper, to a conflict between selling clothes at a cut rate price versus bolstering the rights of workers. In order to keep production prices low, Nova said that companies rely on cheap labor, which often goes hand-in-hand with low wages, poor working conditions and safety concerns. "On one hand, brands are telling factories to improve conditions, but on the other hand they're telling them they need lower prices," he said. "They have workers at factories making 18 cents an hour to keep prices down, but they recognize that the consequence are egregious situations like this fire." While retailers contend with competing interests, local governments also play a role in why these issues aren't addressed. According to Charles Kernaghan, director of the Institute for Global Labour and Human Rights, the Bangladesh government is anxious to hang on to the apparel business because it is a huge part of the country's economy. "It is such a poor country and so desperate for jobs that they ignore the most minimal labor rights standard," he said. "It's as if everything has to give way just to maintain these garment jobs. There's a fear that the labels will flee and go to another country." Workers rights experts say that the government turns a blind eye to buildings with no fire safety standards, filthy factory conditions and pitiful wages. Bangladesh's ready-made garments make up 80% of the country's $24 billion in annual exports, and the country has about 4,500 garment factories that make clothes for large global stores including Gap (GPS), H&M (HNNMY), Wal-Mart, J.C. Penney (JCP), Tesco (TESO), Carrefour (CRERF) and Sears. The country is on track to surpass China within the next eight years as the largest apparel manufacturer in the world, Kernaghan said, because the cost of labor is so cheap. 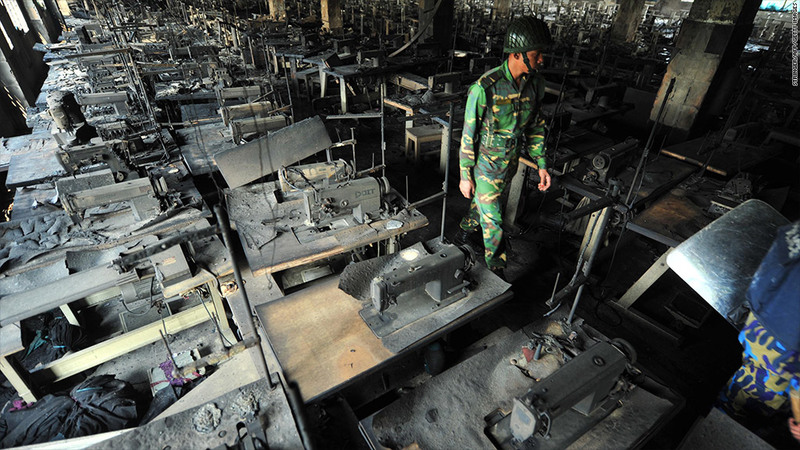 Retailers are well aware of the fire hazards in Bangladesh factories. The fast fashion Swedish global clothing export H&M and J.C. Penney were quick to distance themselves from the Tazreen Factory fire, saying it didn't make their clothes. But they both said in separate statements that they recognize fire safety as a serious issue in Bangladesh apparel factories. J.C. Penney said it joined a coalition of international retailers last year to develop training materials for factories on fire safety standards. And H&M said it is offering an educational film on fire safety awareness, which will reach 4,500 exporting garment factories in Bangladesh, with around 3 million workers by 2013.